TORONTO (Reuters) - Canada's move to legalize recreational marijuana this week is unlikely to immediately trigger a flood of pot-fueled tourism, as tour operators and consumers are unsure about rules governing the brand new industry. There are precedents for Canada to follow in California, Colorado and elsewhere. But observers noted that these U.S. states offering legal recreational marijuana could put a damper on Canada's own pot travel aspirations: Why go all the way to Canada when you can smoke legally a couple of states away? On Wednesday, Canada became the first major industrialized nation to legalize recreational marijuana, sparking huge demand. But those in the tourism industry are meeting legalization with more precaution than promotion. "The tourist is really at the mercy of the drastically changing landscape," said Neev Tapiero, who had a soft launch for his company, Canadian Kush Tours, months ago. "There's still other bugs to work out." The landscape changed on Wednesday with legalization. It will change again in six months when Ontario, Canada's most populous province, allows for private storefronts, and again months after that if edible pot products become legal, he said. Tapiero said he wishes government tourism agencies were more proactive in telling potential tourists what is and isn't legal. Denelle Balfour, a spokeswoman for Ontario's Ministry of Tourism, Culture and Sport, said a general public awareness campaign directs people to an information site. "We've only had a couple of calls" from would-be tourists asking about legal weed, said Gordon Orr, Chief Executive Officer of Tourism Windsor Essex. "One was, 'Where do we get it?'" Some tour operators are hesitant to highlight the fledgling industry. "We don't use it as a promotion tool," said Christian Wolters, Tour Radar's managing director of North America. "If someone specifically is asking questions we indicate it is legal ... but they have to be careful whenever they go back to their own country." Aaron Bowker, spokesman for U.S. Customs and Border Protection, had a tough message for the would-be visitors. "I've been telling people for months now: If you do travel to Canada to recreationally use marijuana and you are a U.S. citizen, you are guaranteed entry to the United States. However ... do not bring it back." 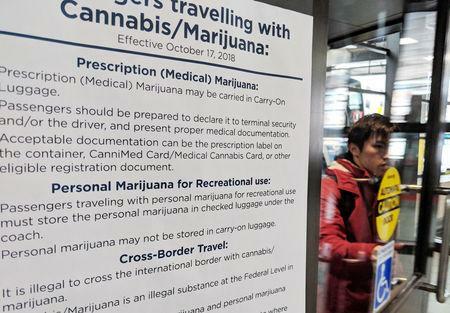 On Wednesday, new posters went up at bus terminals across Canada targeted at a specific demographic: cannabis aficionados. Bus tour operator Greyhound's sign tells passengers where to pack the drug, where they can smoke it and, importantly, what to do with it if they're crossing the border: Leave it behind. 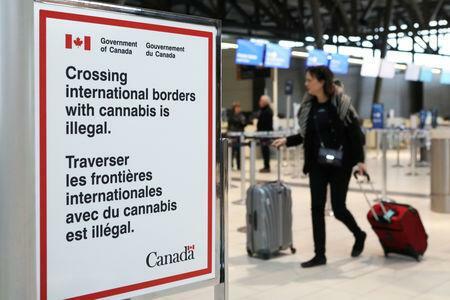 But don't expect American tourists to be too pot-savvy when they cross the border in search of Canada's legal cannabis, said Ryan McConnell, senior vice-president of Kantar Consulting, a firm that recently researched America's "cannabis-curious." "You're going to find some people thinking it's a free-for-all, everything's legal. That's just not the case." Pa. and NJ Adult Use—How's That Legalization Thing Coming Along?